Cellular Shades not only enhance your windows, and room but your wallet too. Energy saving Cellular Shades can save you money on heating and cooling costs by insulating your windows from heat and cold. Home Decorators Collection Cordless Blackout Cellular Shade offers optimum privacy and light blocking with maximum insulation. Best of all, this shade has a cordless feature allowing you to operate the shade without any visible cords, making it a child and pet safe environment. The honeycomb cells are made with durable fabric that form crisp, clean pleats to keep your window looking sleek. 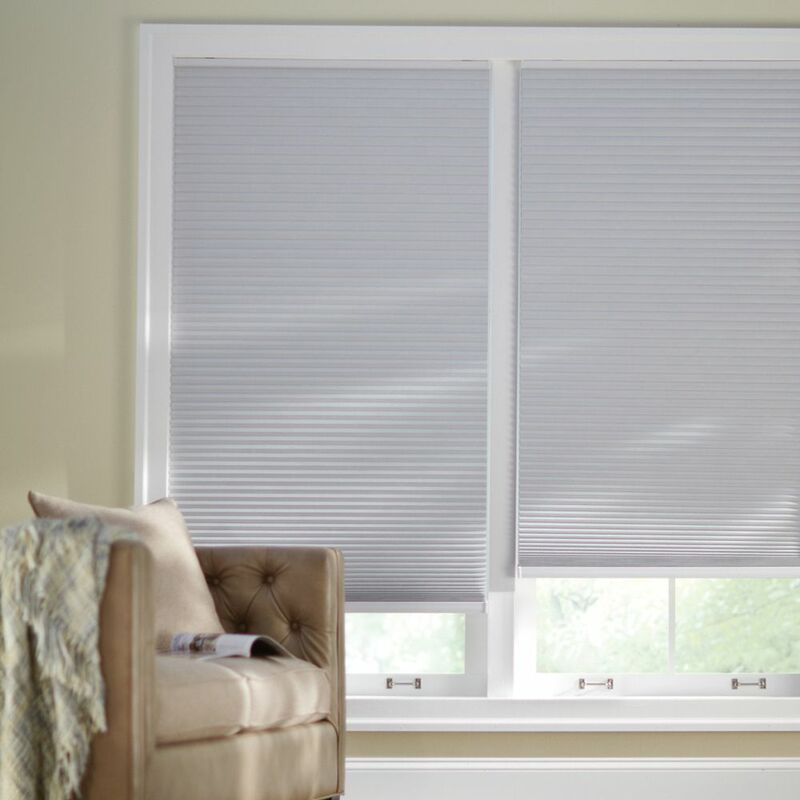 Our Blackout Cordless Cellular Shades provide total room darkening and complete privacy with high insulation quality. This cordless shade operates without any visible cords for added safety in your home. Honeycomb construction creates air chambers that insulate and shield your room from the outside heat or cold to help lower your heating/cooling bills all year-round. The cellular shade is made with durable fabric that form crisp, clean pleats on the shade that keep your window looking sleek. The right window shade can refresh your room with light and colour. When making your choices, be sure to think about how much light you need. A light filtering cellular shade will filter light gently into your space, while a black out cellular shade will stop unwanted brightness. You'll also want to consider tone and texture. What shade will complement your furniture, floor coverings and wall colour? Child-safe and colourful, our Cordless Cellular Shades provide privacy and insulation to your window while softly filtering in natural light. This cordless shade operates without any visible cords, providing a child-safe environment for your home. Honeycomb construction creates air chambers that insulate and shield your room from the outside heat or cold. This unique feature helps lower your heating/cooling bills all year round. The honeycomb shape cells are made with durable, spun lace fabric that form crisp, clean pleats on the shade that keep your window looking sleek. Cordless Blackout Cellular Shade Shadow White 18-inch x 48-inch (Actual width 17.625-inch) Cellular Shades not only enhance your windows, and room but your wallet too. Energy saving Cellular Shades can save you money on heating and cooling costs by insulating your windows from heat and cold. Home Decorators Collection Cordless Blackout Cellular Shade offers optimum privacy and light blocking with maximum insulation. Best of all, this shade has a cordless feature allowing you to operate the shade without any visible cords, making it a child and pet safe environment. The honeycomb cells are made with durable fabric that form crisp, clean pleats to keep your window looking sleek.